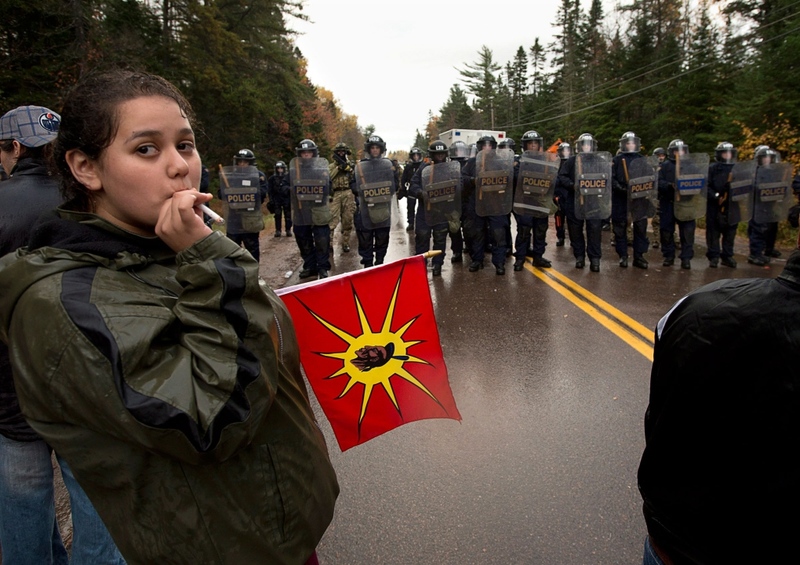 KJIPUKTUK (Halifax) — An Access to Information request has revealed that during the course of anti-shale gas protests in New Brunswick in 2013, 5th Canadian Division Support Base (CDSB) Gagetown, Eastern Canada’s largest military facility, was contacted on two separate occasions by high ranking members of the Mi’kmaq Warrior Society. On each occasion, the Warrior Society – one of the key strategic groups involved in the on-the-ground protests that would ultimately see 100 activists arrested – requested negotiators from the Canadian Armed Forces, citing a breakdown in trust and an increasingly toxic working relationship with the Royal Canadian Mounted Police (RCMP). Both these requests for negotiating assistance took place several weeks before October 17th, 2013, when a coordinated RCMP raid against an anti-shale gas encampment resulted in 40 arrests. In both their communications with 5th CDSB, the Warrior Society would claim that military negotiating assistance was their right, based on a centuries-old treaty signed between the British Crown and the Mi’kmaq nation. Each request, however, was subsequently refused by the Canadian Armed Forces. The military internal documents acquired by the Halifax Media Co-op also show that during the course of a key September, 2013, meeting between the Warrior Society and staff at 5th CDSB Gagetown, the military initiated communication with the Assembly of First Nations Chiefs in New Brunswick (AFNCNB). The AFNCNB, the incorporated body that oversees consultative activities for numerous First Nations reservations in New Brunswick, instructed the military by telephone that the Warrior Society did not represent any First Nations peoples in New Brunswick; the implication being to not take their request for negotiating assistance with the RCMP with any degree of seriousness. 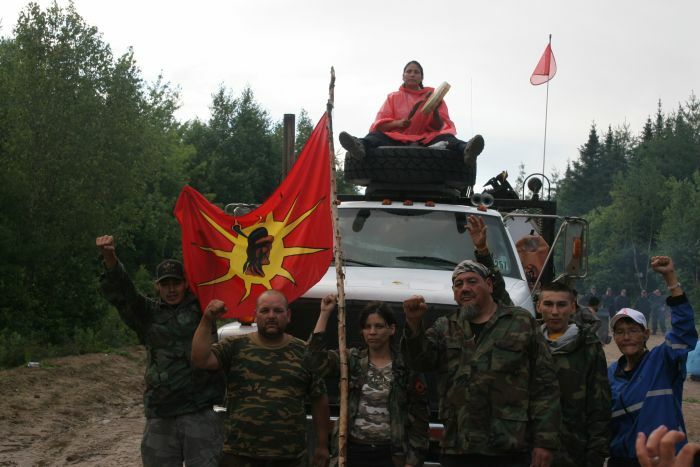 This, despite the fact that Chief and Council of Elsipogtog First Nation – who themselves were signed into the AFNCNB’s consultative ‘umbrella’ at the time – had formally requested the assistance of the Warrior Society as far back as June, 2013. Formalizing the request in writing, Chief and Council had signed a Band Council Resolution (BCR) to this effect. That the AFNCNB was taking multiple thousands of dollars from Southwestern Energy Resources Canada (SWN), the Texas-based company who had obtained the licence to explore for shale gas on over one million hectares of New Brunswick, is well documented. Knowing that on October 17th, 2013, one of the largest inter-provincial deployments of RCMP officers in recent history was to take place against an anti-shale gas blockade in nearby Rexton, New Brunswick, these two requests – and their subsequent refusal – bear detailed examination. According to the internal documents we have obtained, the first Warrior Society request for military assistance came on the afternoon of July 28th, 2013. The prior evening, July 27th, had seen a heated and protracted stand-off, deep in the Kent County, New Brunswick, woods, between local activists and the Mi’kmaq Warrior Society on one side, and the RCMP and SWN workers on the other. A crossroads deep in an unpopulated cut-block had been the scene of an eight hour blockade, where negotiations between the RCMP and activists had seriously deteriorated. On the afternoon of July 28th, returning to the scene of the previous evening’s blockade, “a few dozen protesters” as well as “approximately 12 RCMP officers” – according to the documents – once again stood face to face. At this point, a representative of the Warrior Society, whose name has been redacted from the documents but who has since been identified as Warrior Society ‘General’ Jim Pictou, first contacted Master Corporal MacLeod, a military police officer from 5th CDSB Gagetown. Communication between the Warrior Society and 5th CDSB was subsequently passed to the commanding officer of Gagetown’s military police, Captain Dupuis. In a subsequent conversation, Dupuis noted that Pictou told him that there were over “200 RCMP members currently located at Salmon River Road”, the current site of the standoff, and that the RCMP had arrested or assaulted approximately 30 first nations women on the 27th. In fact there had been no arrests on the evening of the 27th. Pictou tells the Halifax Media Co-op that his mention of the 30 arrested first nations women was misinterpreted and was made in reference to the events of June 21st, 2013, where twelve activists were arrested and an elder from Elsipogtog First Nation had her mouth bloodied, allegedly by RCMP officers. Contact was then established between Dupuis and Inspector Kevin Leahy of the RCMP’s Shale Gas Unit in New Brunswick. Leahy informed Dupuis that the current situation was under control. 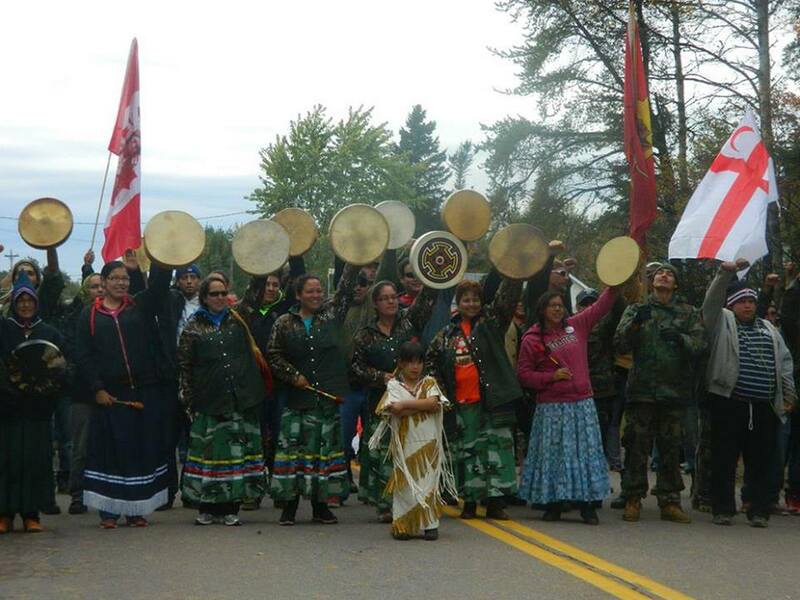 Mi’kmaq rally on Oct 7, 2013. The actual email sent to Dupuis from his superiors has been redacted, but it does not currently appear as though the Warrior Society request for negotiating assistance went to any other federal or provincial department, such as Aboriginal Affairs and Northern Development. It appears as though the decision to refuse their request was a decision made exclusively at 5th CDSB Gagetown, with input from the RCMP. Curiously, however, after this conversation, from July 29th, 2013, until the end of September, 2013, SWN would completely halt its work in Kent County. The second Warrior Society request for assistance took place on September 12th, 2013. At this point, nine or ten (numbers vary in the documents obtained) members of the Warrior Society drove onto 5th CDSB Gagetown, again requesting the assistance of the Canadian Armed Forces in negotiations with the RCMP. This interaction took place during a summer lull in protest activity. Three high ranking members of the Warrior Society, in the documents identified as Suzanne Patles, Jim Pictou and an individual whose name has been redacted, were subsequently interviewed by Captain Genevieve Therrien. Again, the Warrior Society informed Therrien that under the Treaty of 1752, they had a right to request assistance with the Canadian military if negotiations with the Federal Government failed. Therrien took notes on the situation and then excused herself to “make some phone calls”. While Patles, Pictou and a third member of the Warrior Society waited and began to file written statements, Therrien contacted Base Command, along with the RCMP. A few minutes later, for reasons that are not indicated, the AFNCNB was also contacted. Despite repeated requests for comment, no response has been forthcoming from the AFNCNB. 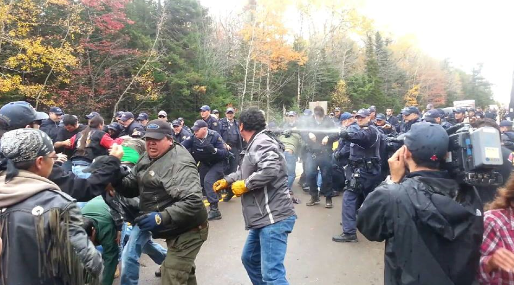 RCMP pepper spray crowd at blockade near Rexton, New Brunswick, Mi’kmaq territory, Oct 17, 2013. Several emails detailing the events, along with a ‘Ministerial Advisory’, were subsequently sent from 5th CDSB to representatives of the Canadian Navy, Airforce, numerous addresses at the Department of National Defence headquarters, as well as the Public Affairs department in Washington, D.C.
Was the Mi’kmaq Warrior Society representative? In answering this question, Jim Pictou tells the Halifax Media Co-op that the assistance of the Warrior Society was formally requested by Chief and Council of Elsipogtog First Nation, and that this request exists in a formal ‘Band Council Resolution’, dated from late June, 2013. For the AFNCNB to then tell 5th CDSB Gagetown that the Warrior Society is “not representative”, is, to Pictou, flat wrong. At a packed community hall meeting in Elsipogtog First Nation on June 22nd, 2013, when the Warrior Society was first introduced to the reservation to come and assist in the anti-shale gas struggle, I witnessed the Society being greeted by cheers and a standing ovation from hundreds of community members. Susan Levi-Peters, former Chief of Elsipogtog First Nation (2004-2008), confirms that the Warrior Society was requested by community members from Elsipogtog, as well as Chief and Council. Did the Warrior Society have a right to military assistance under the Treaty of 1752? The Treaty of 1752, signed on the shores of the Shubenacadie River in central Nova Scotia, is a legally binding document that has been ratified by the Canadian Supreme Court. It has been successfully used in a legal setting to secure hunting and fishing rights. Members of the Mig’maw Warrior Society at anti-fracking rally. Importantly, access to the Treaty of 1752 is for all Mi’kmaq. Prior, successful, legal challenges have come from individuals seeking recourse against Crown law, not from Indian Act representatives, such as reservation Chiefs and Councils, or the incorporated bodies that they form of their own accord, such as the AFNCNB. For the AFNCNB to instruct the Canadian Armed Forces that Jim Pictou and the Mi’kmaq Warrior Society were not representative of any other First Nations people, or that they weren’t elected, hence unimportant, is arguably to deny these individuals their treaty rights. This goes beyond the purview of the AFNCNB, as legal precedent has shown that these treaty rights are self-contained within the individual and are not concentrated within the Indian Act or its representatives. A Treaty-based request for military negotiating assistance against the RCMP was certainly a novel and untested application. But if, as the Civilian Review and Complaints Commission for the RCMP is currently investigating, the RCMP in New Brunswick failed to balance their various mandates, which include the protection of Aboriginal rights, did they then disqualify themselves as a representative of the Crown? At what point could the RCMP be justifiably perceived as simply being hired escorts for SWN’s seismic testing? New Brunswickers had, after all, petitioned by the tens of thousands to demand a moratorium on hydraulic fracturing in their province. The Canadian Armed Forces, as of press time, has not provided a comment for this piece. If and when comment from the CAF is made, we will update this article and make it available in its entirety. Posted on July 29, 2015, in Indian Act Indians, Oil & Gas, State Security Forces and tagged anti-fracking New Brunswick, Assembly of First Nations Chiefs in New Brunswick, Canadian Armed Forces, Elsipogtog First Nation, New Brunswick shale gas protests, RCMP and Natives, Royal Canadian Mounted Police. Bookmark the permalink. Leave a comment.